Brasov is located in the central part of the country, surrounded by the Southern Carpathians, and is part of the Transylvania region. The city was first attested in 1252 under the Latin name Corona or the German name Kronstadt, which means "Crown City", both names being reflected in the city's coat of arms. On the Tampa Mountain, there was a citadel called Brassovia, later giving the Romanian name of the city. 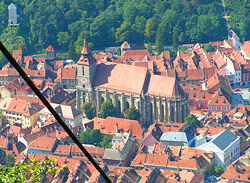 There have been discovered traces of Stone Age settlements in Brasov, and some traces of Dacian citadels. The city was founded by the Teutonic Knights in 1211 to defend the border of the Kingdom of Hungary, and was settled by the Transylvanian Saxons as one of the seven walled citadels known as the Siebenburgen. Traces of the German colonists can be seen in the gothic, baroque and renaissance architecture, and together with the wealth of historical attractions, makes Brasov one of the most visited places in Romania. While in Brasov, make sure you stroll around the old Town Hall Square, located at the heart of the old medieval town, where you can admire colorfully painted and ornately trimmed baroque structures. The square is also the scene of the Golden Stag international music festival. Don't miss the Black Church a few metres away, the largest gothic church in Romania. Its name derives from the damage caused by the Great Fire of 1689, when flames and smoke blackened its walls. The interior is impressive and well-kept and houses one of the largest organs in Eastern Europe. The church windows have recently been fitted out with special UV-filtering glass to protect the 119 Anatolian carpets, donated by German merchants in the 17th and 18th centuries, the largest collection of its kind in Europe. Also, worth visiting is the First Romanian School Museum, housed on the grounds of St. Nicholas Church, the printing press that opened here in 1556 produced some of the first books written in Romanian. The museum hosts a compelling legacy of rare books and documents. 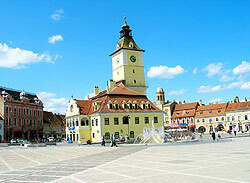 Centrally located in Romania, Brasov is a good starting point for trips around the country. 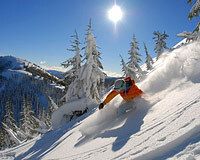 The city also benefits from a winter tourism season centered on winter sports and other activities, in the nearby resort of Poiana Brasov. Brasov is an important hub of the national railway network and a major intersection of roads. The city doesn't yet have an airport, but it is easily accessible from Sibiu or Bucharest. An airport is planned for the near future, as well as a highway that passes right by the city edge. Brasov's local transport network is very well developed, with around 50 bus and trolleybus lines. Taxis are also available, but they will try to exploit the tourists. A more convenient option is to rent a car, for example using services offered by EuroCars. For sightseeing tours, there are also minibus rental services available. Due to the economic boom of the recent years and the increasing number of tourists, Brasov has developed many accommodation offers, such as hotels and hostels, or the option of renting short and long term apartments. Finding the appropiate dining place in Brasov isn't difficult. A great number of restaurants and bars are available, with many of them serving traditional Romanian specialties. There are also fast foods available and many of the bars and clubs are located around the historic centre of the city. Brasov's main shopping areas consist of several malls and shopping centres available throughout the city, although small shops are also a viable option. There are plenty of places to buy souvenirs, the most common being related to Romanian folklore. Apart from the ocasional events that take place in Brasov, there is always a theatre or a cinema to go to for entertainment, as well as art exhibitions. Nightlife in Brasov has a lot to offer on its own. Brasov has something for everyone, like bars and clubs, discos, or even casinos.